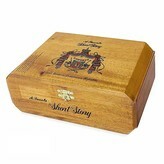 Arturo Fuente's Hemingway series was released in 1983 with great reception, and they remain very popular today. “Hemingway”, though named for the famous novelist, refers to the shape of the cigar- a tapered perfecto foot and figurado body- creates a chic looking cigar. The 4 x 49 vitola is the perfect size to hand out to friends. The natural wrapper lends a more mellow experience for the beginner. Gran Reserva Hemingway received a 90 rating by Cigar Aficionado magazine. Expertly crafted with an African Cameroon wrapper and Dominican long filler and binder, the mild to medium-bodied Hemingway has rich, well-balanced flavors of maplewood and spice with a touch of earthiness. This is the best 20 minutes you’ll ever spend! When pairing the Gran Reserva Hemingway, I cannot recommend Mount Gay Extra Old any more so. This rum from Barbados is medium bodied, yet smooth and mild. It is quite spicy and woodsy, with hints of vanilla, and it is the perfect companion to the cigar's profile. I prefer to drink my rum neat or on the rocks. But this recipe was so delicious I thought I’d share it. Enjoy! Muddle the sugar and bitters in mixing glass. Add Mount Gay Black Barrel or Extra Old Rum, ice and stir. Strain into a rocks glass over ice and garnish with an orange peel.